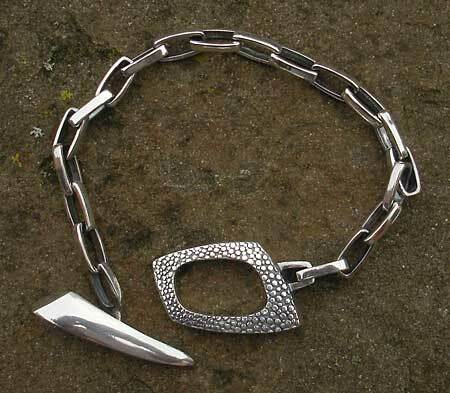 Gothic Silver Chain Bracelet : LOVE2HAVE in the UK! 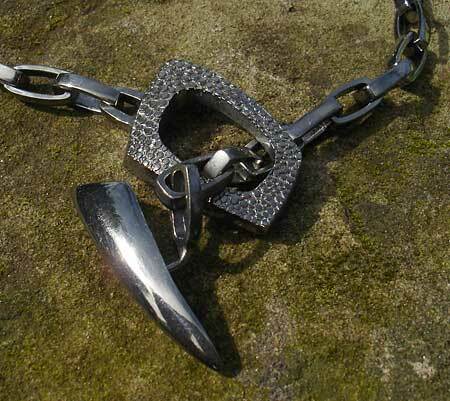 This solid sterling silver Gothic chain bracelet is one of the most unusual Gothic pieces of jewellery we feature when it comes to texturing and designer styling. The polished finish is almost bubbly in texture with it being quite pronounced and very evident to the touch. We would describe the surface as possessing a glistening liquid quality to it over a bobbly surface that we think is somewhat reminiscent of mercury droplets. The spiked T-Bar and eyelet both have a very modern arty shape to them, with the eyelet being almost like a squashed square with a large central gap and rounded edges. 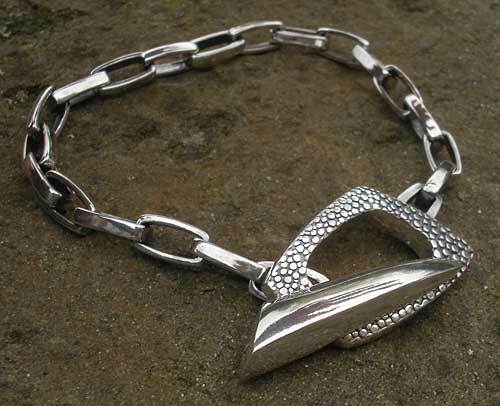 It is 30mm long and 20mm in width, while the spiked fastener is approximately 33mm long by 9mm wide. The chain length is 8.5 inches, and the smooth links are each approximately 10mm long by 5mm wide. Other lengths are also available as well as a matching necklace, and the designer informs us that it is available in a black rhodium colour too.